Georges Benjamin Clemenceu was born 28 September 1841 in Mouilleron-en-Pareds, France, He began his career as a political activist and writer, all the while studying to be a doctor. In 1861, at the age of 20, he co-founded with the some friends, the weekly newsletter entitled Le Travail. In 1862 he spent a 77 day stint in prison for distributing posters for a demonstration. These were the first signs of his radical nature. 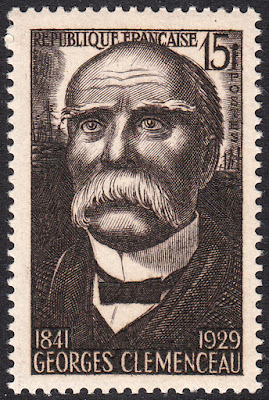 During the years 1862-1865, Clemenceau founded several literary magazines and he wrote many articles for these magazines. Moat of his articles attacked the imperial regime of Napoleon III. In 1965 he completed his studies and graduated as a doctor. In that same year, fearing the imperial regime's crack down on dissidents, he moved to the USA. In New York he opened a medical practice and met the woman who would become his wife. In 1870 he returned to Paris, and for the next 36 years rose through the French political ranks. In 1906 he became Prime Minister. He served for three years till 1909. Then in 1917, towards the end of World War I, he became Prime Minster for the second time. He advocated total victory over the German Empire, and he was one of the primary architects of the Treaty of Versailles. It was his rigid stance against the German Empire that earned him the nickname Le Tigre (The Tiger). He died on 24 November 1929 after a long and illustrious career. 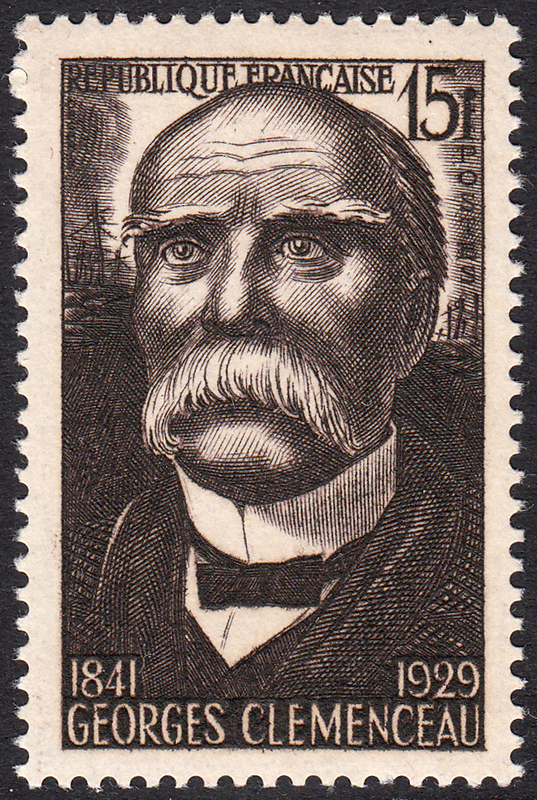 On 12 November 1951, France issued a stamp with a face value of 15f commemorating this interesting French statesman. It was designed and engraved by Albert Decaris. The dark, confronting nature of this stamp is striking. And the crisp, living detail highlight the burgeoning talent of Decaris. Just look at that moustache! One is also drawn to the eyes of the statesman. They suggest of an analytical, and perhaps slightly haunted, mind. This is a beautiful addition to Decaris' growing body of work.